Earlier this week, we went through my professional site to show you the kinds of plans you might make after conducting a content audit. Yesterday we took a look at Yolander Prinzel's freelance writer website. And today I'd like to follow up with one more site review, for David Rodeck. 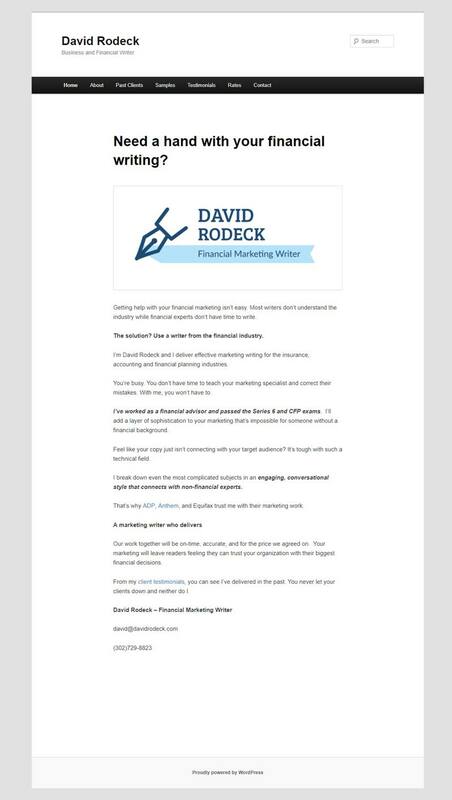 David Rodeck is a business and financial writer similar to Yolander, so this is a good opportunity to look at two professional sites in the same specialty area to compare and contrast. But for this post, we'll look at David's site individually. Let's start with an overview. I'm not really sure what to say about this site in terms of highlights. The biggest thing it has going for it is its simplicity. But that also comes at a cost. That might work in David's case if he doesn't need his site to bring in frequent leads (such as if he's getting more from referrals). But if you need your site to work harder as an inbound marketing tool, I'd add to this one. So let's jump right into the suggestions. On quick glance (which is all you'll get from prospects if your site doesn't immediately help them find what they want), I have no idea what kinds of projects David takes on. There's no obvious service list. There's not even a Services pages in the navigation (which, like the About page I've suggested other freelancers add to their sites, is the kind of page prospects are going to look for by default). I'd suggest adding this info as a priority, even if it's just a list on the homepage that pops from the body copy. Check over all pages and make sure they have a call-to-action (CTA). For example, at the end of David's About page, I'd suggest prompting people to contact him instead of just leaving them hanging after giving them background. I feel like there's too much going on in the main navigation for social proof. A client list, a portfolio, and a separate testimonials page aren't necessary. Most prospects aren't going to sit there clicking all over your site. So direct them where you want them to go wisely. David's site is a great example where all of this can be combined. For example, if he started with his Past Clients page where he describes his work history with key clients, he could link to samples of work he's done for them right there. Then if they've provided a testimonial, that could be included too. The information is there to make a good case for hiring him. But right now it feels a bit scattered. This is a minor thing, but if your main contact info is an email address, link it. It's not a big deal if you also have a contact form, but don't force prospects to copy/paste something to reach you. Make it easier on them by giving them a simple email link or a contact form where they can write to you directly from your site. If you don't actually list rates, don't bother with a Rates page. What's there on David's page are payment terms, and that's different. There's nothing on the Rates page that actually tells prospects how much they can expect to pay for a typical project. Now I know David had talked to Peter Bowerman about this. And while I adore Peter, publishing rates is an area where we have long disagreed. (You can see us both weigh in on this issue in the comments on Chris Bibey's 2011 post on freelance fee schedules for example.) I feel very strongly about publishing your rates. That's especially true if you're a newer writer or you need your site to attract and convert clients. 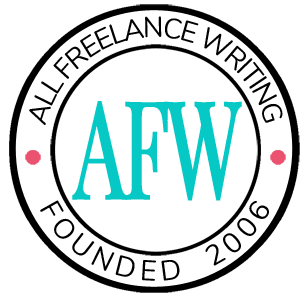 (Some writers don't -- those who have been at it long enough that more work comes from repeat clients and referrals... those who mostly market through pitching... those working with larger corporate clients exclusively... and those writing primarily for magazines where they don't directly set all of their rates for example.) I've worked with quite a lot of newer writers over the last decade, and one thing they've never told me they regret is adding rates to their site. It more often helps them weed out tire-kickers and those who don't come close to being able to afford them. I've also hired dozens of writers for my own properties and on behalf of clients, and I can tell you from the perspective of an actual client, I don't hire any freelancer who doesn't publish rate information. If you don't give me the info I'm looking for, and your competition does, you're off the list before I even contact you. Making your prospects' lives more difficult isn't a safe bet for convincing them to hire you. We'll go into this more later this month, giving the issue a post all its own. But my recommendation is to add the rates (even if they're just starting rates or example rates). And if David opts not to do that, I'd suggest scrapping the Rates page and including the payment terms elsewhere. Having a Rates page with no actual rate information is misleading. Perhaps the biggest issue I have when looking at this site from the perspective of a prospect is that there's no feel for a brand here at all -- not even a personal one. It's minimalist, but it doesn't look intentionally so. It looks more like a default theme was slapped on a new site, some basic copy was tossed on, and it's still in development. It just looks unfinished. I'd choose a new theme -- one that's appropriate for the kinds of businesses David works with. I'd add a logo or at least more stylized text for the site name. And I'd be clearer about the branding behind his services. Right now his header lists him as a "business and financial writer." The image on his homepage lists him as a "financial marketing writer." Which is it? The first is very general. The second is more specialized. If it's still accurate, I'd focus more on the latter. But either way I'd suggest settling on a consistent way of presenting his services. There's certainly room to add things here -- a blog, individual service pages, and maybe a resource or two (like a white paper or other short report). But I don't think they're necessary unless David wants to use them to improve search engine rankings or he plans to use a download as incentive to launch an email list. I hope those suggestions help David and give you some things to evaluate about your own freelance writer website. Next week we'll dive more into the issue of publishing your rates.